It’s not your fault, home IPL and Laser hair removal devices look almost identical, and trying to distinguish between the two can be tricky. After several weeks of research, we managed to get our heads around this technology and we’re now well-versed in how these machines work, and more importantly, how they differ. IPL – short for “Intense Pulsed Light” – is a treatment for permanent hair removal, which is often confused with “Laser Hair Removal”. In fact, it’s common for people to mistakenly refer to IPL machine treatment as “IPL Laser Hair Removal” – which is inaccurate, as you’re about to learn. Sure, they do the same thing, in that they reduce body hair, and their mode of delivery appears to be the same – a hand held, mains powered device delivers a beam of light to the surface of the skin to kill hair growth– but the composition of the beams of light differ greatly. While the basic technologies are quite similar, they’re also very different. It’s true that the origin of light from both machines are emitted in bursts from an internal flash lamp. But it’s the type of light that separates these machines. If you’re looking to buy a laser or IPL hair remover, the only way to tell them apart is by attentively reading the product name and description. The machine you’re interested in should be clearly labeled as either “IPL” or “laser”, not both. By the way, from our research, our best IPL hair machine for home use is the Philips Lumea Prestige IPL. So, you might want to check that out. But if you want to know more about these two machines, read on. Laser hair removal machines produce a single, monochromatic, amplified wave length of light. The word laser, is the abbreviation of – Light. Amplification. Stimulated. Emission. Radiations. There, you learn something new every day, unless you’re a Laser Scientist, you already knew that. IPL however, produces an entirly different light. Unlike laser, the light is not condensed into a single spectrum, nor is it amplified. IPL produces a polychromatic light, composed of different colours at various wave lengths. Laser light is coherent, meaning that it produces a single, synchronized, and unified wave length of intense light. It’s a single, focus beam of light that is concentrated on a small target surface. For example, a hair follicle. IPL light is incoherent because it is composed if light waves emitted at various lengths. It’s a broad wave length of light that can treat a larger surface area. For example, several follicles at once. Imagine a rainbow, lasers uses one spectrum/wavelength/colour of light, while IPL uses the whole rainbow. If you can image someone shining a laser pan into a wall, there would be a small dot. Now, imagine that someone is standing next to that person with a small torch, or flashlight and shinning it in the same wall, there would be a large circle of light. As mentioned, it’s quite common to mix up laser and IPL hair reduction treatments, especially since IPL is sometimes referred to as “IPL laser treatment”, which further adds to the confusion. The beam that IPL emanates is purely a wide spectrum of light, without the use of any direct lasers – that’s the key difference between them. Performance Difference Between IPL and Laser Hair Removal? Both IPL as well as laser hair reduction treatments have been widely available since the 1990’s and they both utilize light energy to cause damage in the hair shaft that disrupts the growth process of the hair. Hairs on your skin are at different growth stages. Fully grown hairs are zapped by the IPL or laser light which penetrates the surface of the skin where it’s absorbed by the melanin in the hair shaft and converted into intense heath that “damages” the growth process. Hairs naturally fall out over a few days to a week. The heat damages the growth cells by scarring them and destroying their ability to regrow – without surrounding skin cell damage. You might be thinking “burning, sounds painful” but laser and IPL treatment is comfortable and painless for most people. With that said, everyone is different, most people are fine, but you might be someone who experiences a problem after laser treatment. Always test a small area first, such as a small patch on your forearm or lower leg to see how you respond before treating a larger area, and consult with a dermatologist before using an IPL or Laser machine. Performance and results from IPL’s and Lasers for permanent hair removal (though you need several session to get complete removal) are much the same. Lasers may be more favourable for thicker hairs and are typically the machines used by clinics. However, in our humble opinion, the best choice for home hair removal is IPL over Laser, because manufacturers such as Braun, Philips, and Smooth Skin offer the best products using IPL technology. Although the IPL treatment is not completely pain-free, it is considerably less painful compared to other hair removal methods like waxing or epilation. Since IPL destroys the root of the hair, it stops the hair follicle from re-growing. This translates into eventually needing less treatment as time goes by. Hair removal methods that involve pulling the hair out by the root, such as waxing or epilation, require a certain amount of hair growth for the method to be carried out. For IPL, however, you don’t need any such regrowth, as certain wavelengths from the spectrum target the hair follicles directly. There is a much wider, and better, range of IPL products that greatly exceed what Laser has to offer. 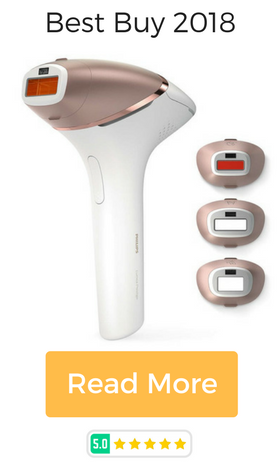 Braun Silk Expert, Philips Lumea Precision, and Smooth Skin Gold 200, are some of the best IPL machine out there that are packed with the most advanced features and produce some of the best results. Of course, with every great product comes some drawbacks you might want to think about. The pigment melanin in the hair follicle plays an important role in the IPL hair removal process and this is why this treatment is not always suitable for people with darker skin tones as it can cause burns on these. People with hair that is white, grey, light-coloured or red, too, are not suited to IPL treatment due to the lack of melanin in their hair follicles. Laser treatment, on the other hand, is generally better suited to a wider range of skin colours. Since the spectrum of light includes some wavelengths that get absorbed by the hair follicle, as well as others that bounce off the skin, it might take a longer for you to actually see good results from the treatment. We hope that our rundown on IPL hair removal, how it is different from laser treatment and its various pros and cons has helped you gain some insight into this kind of hair removal method.